Item # 10419 Price: SOLD Tell me more! Perfect creamy pearls!! 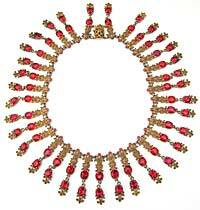 The faux glass pearls are in exquisite condition for a necklace of this age. They show no loss of finish, scratches or nicks. The tear drop shaped pearls are capped with ornate silver leaves that drop by their chains through a pearl encrusted silver oval. Item # 10409 Price: $125 USD Tell me more! A delightful vintage 1950s peachy pink plastic clamper bracelet by Weiss. The front has been liberally sprinkled with sparkling aurora borealis and clear rhinestones. Hallmarked and in excellent condition. Item #10478 Price: $275 USD Tell me more! Romantic gold locket! This lovely little locket is 10k gold over silver. Hallmarked as such on the back. The central heart rests on a larger mother of pearl heart. Perfect condition with original chain. It is rare to find one of these with the original chain. Picture frames inside also present and in perfect condition. Item #10445 Price: $65 USD Tell me more! A classic ivory plastic clamper bracelet by Weiss. Sprinkled with large rhinestones of amethyst, peridot, sapphire, and tourmaline pink. Between the colored stones are diamonds formed of clear rhinestones. Extremely Fine condition. Hallmarked Weiss. Item #10536 Price: $275 USD Tell me more! Very musical! 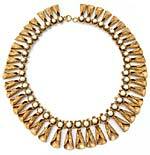 An interesting necklace created from hollow brass balls. The heavily textured surface of the balls causes them to reflect the light in thousands of golden glints. As the balls bump into one another they chime softly. A delightful necklace to wear! Item # 10429 Price: $65 USD Tell me more! Deliciously purple! If you are a lover of purples, this necklace is for you. Comprised of oval faceted amethyst glass stones prong set in open backed settings, ornately stamped brass and mauve guilloche enamel and a brass paper clip chain. Item # 10171 Price: $175 USD Tell me more! A vintage Weiss clamper bracelet set with sparkling pastel colored marquise rhinestones. Smaller round clear rhinestones have been sprinkled between the larger pastel rhinestones. The bracelet itself is ivory colored plastic. Hallmarked, WEISS. Item # 10540 Price: $275 USD Tell me more! Intriguing! Wear this and you will be the immediate focus of attention no matter what room you enter. First they will hear you coming. Imagine the sound of the wind rustling delicate brass leaves. And then all eyes will focus on the source of this delightful sound. Oh my! Needless to say, I love this necklace. Everytime I put it on, my heart becomes a little happier. It is created entirely from stamped brass hammered into cones atop which are placed lovely brass roses. The centers of the roses are glass faux pearls. Item # 10016 Price: $145 USD Tell me more! Item #10722 Price: SOLD Tell me more!